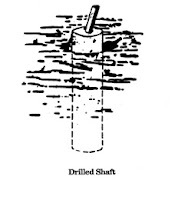 A drilled shaft is a cylindrical excavation from which all of the soil or rock has been removed. The diameters of drilled shafts for transmission structures are controlled by the size of the anchor bolt circle or the stub angle geometry, and thus can be from 2 ft (0.6 m) to 10 ft (3 m), or larger. A drilled shaft should be excavated to the required depth with equipment that gives a true dimensional hole with straight walls. 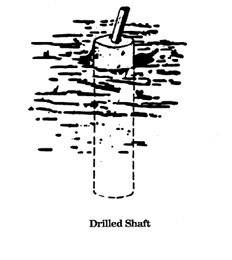 Where rock is near the ground surface, drilled shafts that penetrate the rock are common. This excavation can be done by methods that will be discussed herein. Auger-type drilling rigs are available in a wide variety of mounting and driving arrangements. The choice normally is the contractor’s preference, based on experience and the capability of the machine. The equipment should be suitable to complete the job. In addition to the auger-type drilling rigs, there are rotary rigs that use circulating drilling fluid to carry the cuttings out of the excavation. These rigs can be used in wet-hole construction to drill large diameter, uncased foundations. In noncaving soils where a drilled hole stands open readily, straight holes are drilled quickly, usually with an open-helix auger having two or three turns of a single ßight. In these areas, the concrete is placed with few, if any, problems. When a hole is being drilled in stable soil and a soft stratum of clay or organic silt is encountered, this stratum tends to squeeze in and reduce the diameter of the hole. A casing should be inserted to limit this action and to protect the hole. The casing can be advanced by driving or drilling ahead of the excavation through the squeezing zone. Cohesionless soils, sandy silts, and gravels usually will cave when drilled by auger, either above or below the water table. The usual and direct way of coping with a caving soil is to install casing as the hole proceeds through the caving formation. In some caving soil, it is possible to drill the hole quickly and insert the casing freely before caving starts. Immediately prior to the placement of concrete, the bottom of the drilled shaft should be clean and dry. If the bottom of the hole contains a few inches of water or mud, enough cement or gravel cement mix must be added to absorb the water and form a paste or soil-cement mix so rich that it will protect the concrete as it is placed in the bottom of the foundation. Past experience has shown that freely-falling concrete does not segregate, but concrete discharged into the drilled shaft from the chute of the transit mixer invariably will strike the reinforcing and the side of the hole as it falls. This type of placement should be avoided. A hopper centered over the hole with a section of elephant trunk attached to its bottom is necessary to take the concrete from the chute of the truck or the concrete bucket and concentrate it in a small stream to the bottom of the excavation. Concrete slump and maximum aggregate size should be controlled so that the concrete will flow freely around the reinforcing bars and completely fill the area outside the cage. The slump should be between 4Ð6 in (100-150 mm). The concrete should be vibrated in the top 10-15 ft (3-4.5 m) so that it makes complete contact with the reinforcing and anchor bolts. This vibration also prevents voids in the part of the foundation where the hydrostatic pressure of the wet concrete is the lowest. Vibration should not be done until the casing has been removed, because it could cause packing and wedging of sand and gravel outside the casing, resulting in considerable difficulty in pulling the casing. Although not always possible, the placement of concrete in the drilled shaft should be continuous. When a partially filled drilled shaft is allowed to stand until the concrete has taken its initial set, the exposed surface will require cleaning before more concrete can be placed to ensure a good bond between the old and new concrete. The scum or laitance that settles on the top of the newly-set concrete should be removed, and the surface should be roughened. Just before the pour is resumed, a slush of cement grout should be spread over the top of the old concrete. All reinforcing bars should be cleaned of old cement grout. When a hole has been cased to seal out water, the casing must not be disturbed until enough concrete has been placed to produce a higher concrete pressure at the level of the casing seal than the water pressure outside the casing at that level. If this procedure is not followed, water can enter the concrete column, causing voids or zones where aggregate is washed clean of cement. Also, the concrete level in the casing must be maintained at a high level as it is pulled because voids outside the casing will cause concrete to flow from the casing to fill them. When telescope casing is used, it is necessary to place enough concrete in the casing section so that the surface of the concrete does not fall below the bottom of the next larger casing. This surface will depend on the relative positions of the top of the bottom casing, the bottom of the next section, the level of groundwater outside the bottom section, and the volume of water to be displaced outside the lower casing and below the bottom of the next sections. If there has been extensive caving during drilling, or if the lower formation is cavernous, the concrete level should be watched carefully as the bottom section is lifted. More concrete should be added if it appears the concrete level is about to fall below the bottom of the next section to prevent inflow of groundwater. Casing should always be pulled in an axial direction as slowly and steadily as possible. The concrete level must be maintained so that it never falls below the bottom of the casing until the top of the foundation has been reached.